Today, the concrete choices have expanded to include a multitude of decorative concrete options. Referred to as colored cement, the effects that can be achieved with decorative applications can be astounding on concrete driveways. While plain grey concrete is still the most often installed, but don’t feel left out! Here at Yoder Laser Concrete we can overlay your existing grey concrete driveway with a decorative and more revealing driveway. But why stop there? Decorative concrete can be used in many different residential applications such as side walks, patios, steps, and so on! But wait we don’t stop there! Yoder Laser Concrete is here to meet all your concrete needs by providing a wide array of other residential concrete services. 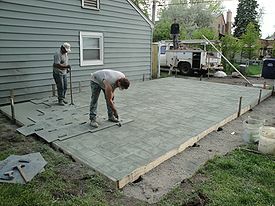 Need a basement or a garage floor? We have you covered! Require retaining walls or footers? We are there! Contact us today so we can ensure your next residential concrete job leaves you satisfied for many years to come!